Relations between Turkey and Greece have long been sour, but Turkish tourists keep coming to Thessaloniki. Turkey΄s current president and its founder are two very disparate reasons for the burgeoning tourist hub.On Agios Dimitrios Street in Thessaloniki sits the city΄s most securely guarded building. The old pink, picturesque building is surrounded by high metal walls and is guarded around the clock by heavily armed police. The building houses the Turkish consulate. It is also where the founder of modern Turkey, Mustafa Kemal Ataturk, was born in 1880. 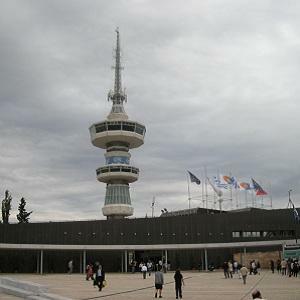 It is this building that brings tens of thousands of tourists to Greece΄s second-largest metropolis year after year. Every day, tour buses bring interested visitors from Greece΄s neighbor to the birthplace of their national hero. One visitor is Necat Altin. His family fled Thessaloniki during the Balkan wars and settled in Aynalik, a small city on Turkey΄s coast opposite the Greek island of Lesbos. He feels at home here, he said. On this vacation, he has brought his two daughters to Ataturk΄s birthplace so they can learn a bit of history. "I don΄t really think there is tension between Turkish and Greek people," he said. "This is just politics and has nothing to do with people." Altin does not support his government΄s current aggressive posture. Nor does Cengiz Erkonak from Izmir, who thinks mostly about easing tensions between the two countries. "The only reason there aren΄t more Turks coming to Greece is because of the visa conditions," he said. "If we could travel in the Schengen Zone without a visa there would be much more tourism." Erkonak is visiting Greece with his sister, who sees a lot of similarities between Thessaloniki and Izmir. "Everything reminds me of home: the food, the way people are and the traffic," she said. Meanwhile, she views her country΄s president, Recep Tayyip Erdogan, as a dictator. It is an opinion many Turks share here, but not all express. Turkey and Greece have had tense relations for a long time. Turkish fighter jets regularly violate Greek airspace. At the end of 2016, Ankara announced it would reconsider the Lausanne Treaty of 1923, in which Turkey explicitly renounced all claims on the Dodecanese Islands. Turkey΄s relations with the EU have in general worsened since President Erdogan tightened his grip on power following the failed coup in summer 2016. Tensions have not kept Turkish tourists away from Thessaloniki. The city΄s hotel association registered more than 39,000 bookings in the first half of 2017, marking a five-percent increase from last year. "In numbers, Turkish tourism ranks second in Thessaloniki – after the Cypriots and before the Germans," said Kostis Chantzaridis, the head of the local tourism association. This is due not only geographic proximity, but also historic similarities, he said. Thessaloniki, in northern Greece, was part of the Ottoman Empire until 1913. Greece΄s Ottoman population was forcibly resettled in Turkey following the Greco-Turkish War of 1919–1922. More than one million Greeks were sent in the other direction. "In school, Turks are described as occupiers more than anything. They΄re painted as enemies," said Konstantinos Drakotis, who owns a souvenir shop near the Ataturk birth home. His reality is different: "Contact with Turkish visitors is above all positive. We have a lot in common and they bring in a lot of money to the city," he said. Not all in Thessaloniki share his view. Rising tensions between Athens and Ankara have taken their toll on local conversations. Yet for many Turks who visit Ataturk΄s birth home, it is a symbol of their country΄s modern republic and a separation of religion and state. "It΄s moving to be here in this house and take stock of objects from his life," Erkonak said. Like his sister, he is critical of Erdogan΄s governing style and threats to Europe. "I don΄t think Turkey should make demands for the Greek islands," he said. "Greek life is now here."